Suzuki Intruder prices start at Rs. 1.00 lakh (Ex-Showroom) and the top end variant Suzuki Intruder Fi SP is priced at Rs. 1.08 lakh (Ex-Showroom). 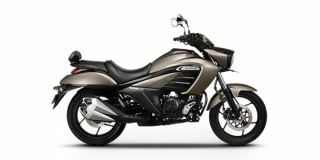 Suzuki Intruder is available in 4 variants and 3 colours. The claimed ARAI mileage for the Suzuki Intruder petrol is 47 kmpl. I don´t know. But you can ride a Suzuki GZ150, a very comfortable Chopper. Is the fuel-injected version of the Intruder worth the extra premium over the carb trim? The Intruder name makes a comeback in the Indian market, this time in a 150cc guise. We get astride one of the most divisive motorcycles of recent times to find out if there’s any real muscle under all that mass. The Intruder 150 is powered by the same 154.9cc air-cooled petrol engine seen on the Gixxer 150 but in a slightly different tune. It produces 14.14PS at 8000 rpm and 14Nm at 6000rpm. The motor has a slightly different state of tune owing to a larger air intake, airbox and tuned exhaust. It is mated to a 5-speed manual gearbox borrowed from the Gixxer but with a larger rear sprocket for low-end performance. It has a fuel tank of 11 litres and weighs about 148kg, 8kg more than the Gixxer. Braking is done by disc brakes fitted at both ends. Bajaj Avenger 180: The Bajaj Avenger 180 replaces the Avenger 150 for a price bump of Rs 5,000. For this premium, it not only gets more power than the model it replaces but also its rival, the Suzuki Intruder 150. The style and feature upgrades have given it a modern look, while not feeling overly done, unlike the Intruder 150. Add to that Suzuki’s asking price of around Rs 14,000 over the Bajaj Avenger 180 and the Bajaj comes across as a great value-for-money motorcycle. More so, when you can use the saved cash to buy a good set of riding gear for those long weekend rides. At Rs 99,995 the Intruder 150 is more expensive than the Avenger 180 by almost Rs 14,000. For that premium, you get a cruiser that looks like a 250cc model and gets the positive traits of the Gixxer like peppy performance and handling. The ride is on the stiffer side but it gets better with a pillion. If you like its imposing looks and are looking for a comfortable ride to replace your daily commute, this might be it.